Up to now, they only found fragments of fossil penguins on the Southern hemisphere, in the same areas where today penguins live. This indicates that the areas where penguins live didn't change much during time. You shouldn't think now that they found complete, perfectly saved skeletons. Only through fine criminological work these founds could be attributed to penguins, because it were just individual bones from feet or flippers or pieces of skull or breastbone. Luckily these are the bones that illuminate the evolution from a life of flying to a life in the water. Most of the fossils from the 32 different penguin-species have been found in New-Zealand and Argentine. Some came from South Africa and northern Australia. It is striking that there is only one place in Antarctica, namely on Seymour Island, where fossils of that kind were found. This leads to following conclusion : the evolution of penguins started in the seas around New-Zealand. More than half of the 17 species still live in these sub-tropical to middle-warm waters. Only emperors and their footmen, the adélie penguins, live exclusively on Antarctica. The thus far found fossils points to the conclusion that there existed a lot more species and that those species were much larger too. One special species,the Anthropornis nordenskjoeldi was 1,7 m tall and almost as tall as a human being. Another one, the Pachydyptes ponderosus, presumable measured about 100 kg and was 1,6 m tall. 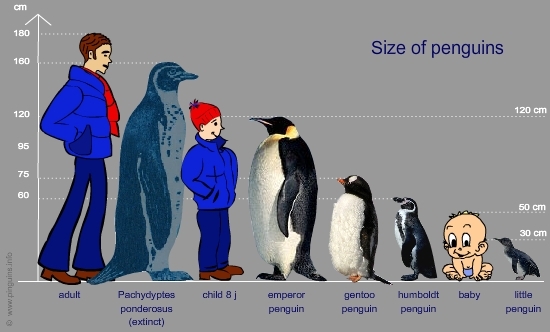 In opposite to this, the modern largest species, the emperor, with his 1,2 m, is only as tall as a child and the little blue could really be called a dwarf, as he only measures 30 cm.